Hey kids, what time is it? It's time to revisit the "Principle of Maximum Ruin." The same principle applies today to America, to Europe and to China. If you listen to TV or read the newspaper, then you know that mainstream economists, politicians and analysts have been predicting an improving economy for the next quarter each quarter for the last four years. They've been predicting that housing prices would go up next quarter, for each of the last 12-16 quarters. "[We're seeing] a 'soft patch' in the economy. This has taken the returns of the 3 of the most well known stock pickers in the market. 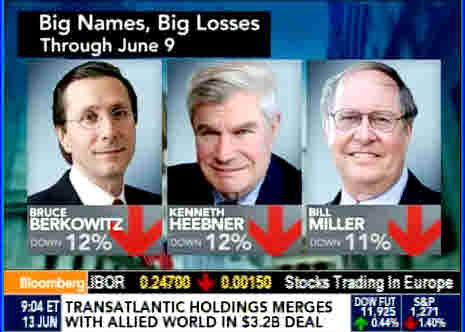 We're talking about Bruce Berkowitz, Kenneth Heebner and Ben Miller, each of them posting losses of about 11-12%. so far this year, for the worst big fund performance tracked by Morningstar. The problem is that they all made sizable bets on an economic recovery. Berkowitz has about 74% of his funds in financial stocks, Bill Miller about a third in financials. Heebner has bet large on automakers, and those groups are all down at double digit percentages this year." "A common feature of all these earlier troubles [previous panics] was that having happened they were over. The worst was reasonably recognizable as such. The singular feature of the great crash of 1929 was that the worst continued to worsen. What looked one day like the end proved on the next day to have been only the beginning. Nothing could have been more ingeniously designed to maximize the suffering, and also to insure that as few as possible escaped the common misfortune. Based on this passage, which I've quoted many times, I began referring to the Principle of Maximum Ruin. During a financial crash following the implosion of a generational credit bubble, the markets act in an incredibly ingenious manner, to ruin the maximum number of people to the maximum extent possible. That's what Galbraith is describing. Today we're seeing the same thing happen again. When President Herbert Hoover predicted that "Prosperity is just around the corner," it wasn't because he was a stupid man. He was listening to economists of the day who advised him. When President Barack Obama scheduled his "Summer of Growth" political tour a year ago, he was listening to his own economic aides. And it's not just Democrats who are lying. I heard Republican candidate Tim Pawlenty predict that U.S. economic growth will exceed 6% per year for next few years, something that's utter nonsense. Investors in funds by Berkowitz, Heebner and Miller have lost a great deal of money, and it's not over. They depended on what they heard from the President and his advisers, and what they heard from "experts" on CNBC and Bloomberg TV who earn their seven-figure salaries by lying about price/earnings ratios and telling everyone that it's ok to buy stocks and pay brokers' commissions. These erroneous predictions are based on mainstream macroeconomic models using data from the 1970s and 1980s. This is the "economics of the Maginot Line," as one commentator said, because you're assuming static data at a time of dynamic changes. As I've pointed out many times, the 70s-80s were dominated by generations of people who had lived through and survived the Great Depression, and so were extremely risk-averse. Those generations are long gone, and it's absurd to apply those static models to today's realities. 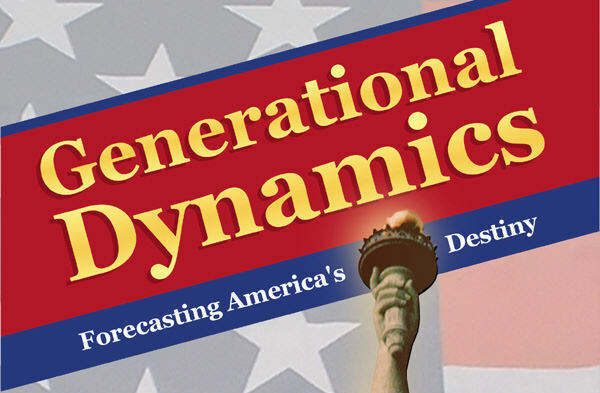 Generational Dynamics is to macroeconomics as macroeconomics is to microeconomics. Macroeconomics models aggregate microeconomics models over the entire population, and Generational Dynamics models aggregate macroeconomic models over time. Macroeconomics models are completely static in time, and economists assume that the same macroeconomics model that worked in the 70s and 80s also work today, an assumption which is completely absurd on its face. As I've pointed out many times, economists have been consistently wrong about everything, at least since 1995. They didn't predict and can't explain the 1990s tech bubble, the real estate and credit bubbles, the financial crisis since 2007, where we are today, and what's coming next year. Their predictions are no better than flipping a coin. A web site reader has called my attention to a paper by economist Steve Keen called Dude! Where�s My Recovery? (PDF). Keen's paper is of great interest to me because it answers an important question for Generational Dynamics theory. I've been saying for years that mainstream economists have erroneously been using data from different generations (Great Depression survivors) in the models they use to analyze today's economy, and that error was causing them to get everything wrong. But I never knew the precise error that the mainstream economists were making, and Keen's paper describes it in detail. "Neoclassical economists ignore the level of private debt, on the basis of the � priori argument that �one man�s liability is another man�s asset�, so that the aggregate level of debt has no macroeconomic impact. They reason that the increase in the debtor�s spending power is offset by the fall in the lender�s spending power, and there is therefore no change to aggregate demand." In other words, you can ignore private debt because it cancels out. If I owe you $1000, then I have $1000 less, and you have $1000 more, and so the amounts cancel out and shouldn't affect the macroeconomic models. Now, before going on with Keen's analysis, let me say how taken aback I am by this. To say that private debt can be ignored because it gets canceled out is near the top of the greatest statements of economic idiocy that I've heard. The amounts definitely do NOT cancel out. Suppose I have $1,000 and you have nothing. I deposit the $1,000 in the bank, and you borrow the $1,000 from the bank. Then $1,000 has turned into $2,000. That is, I still have $1,000 (it's in my bank account), and you have $1,000 (it's in your pocket). This is not a joke, or a gimmick, or a trick scenario. This is how money is "created" these days. When you purchase a corporate bond for $1,000, then the corporation gets $1,000 and you get a piece of paper, an asset, worth $1,000. You can't use the bond to buy groceries, but you can use it as collateral for a loan to get cash with which to buy groceries. "The Credit Accelerator at any point in time is the change in the change in debt over previous year, divided by the GDP figure for that point in time." "[T]here are two sources of money: incomes, and the change in debt. The second factor is ignored by neoclassical economics, but is vital to understanding a capitalist economy. Aggregate demand is therefore equal to Aggregate Supply plus the change in debt." "Therefore the rate of change of asset prices is related to the acceleration of debt. ... Our great misfortune is that accelerating debt hasn�t been primarily used for that purpose, but has instead financed asset price bubbles. There isn�t a one-to-one link between accelerating debt and asset price rises: some of the borrowed money drives up production (think SUVs during the boom), consumer prices, the fraction of existing assets sold, and the production of new assets (think McMansions during the boom). But the more the economy becomes a disguised Ponzi Scheme, the more the acceleration of debt turns up in rising asset prices. As Schumpeter�s analysis shows, accelerating debt should lead change in output in a well-functioning economy; we unfortunately live in a Ponzi economy where accelerating debt leads to asset price bubbles. In a well-functioning economy, periods of acceleration of debt would be followed by periods of deceleration, so that the ratio of debt to GDP cycled but did not rise over time. In a Ponzi economy, the acceleration of debt remains positive most of the time, leading not merely to cycles in the debt to GDP ratio, but a secular trend towards rising debt. When that trend exhausts itself, a Depression ensues� which is where we are now. Deleveraging replaces rising debt, the debt to GDP ratio falls, and debt starts to reduce aggregate demand rather than increase it as happens during a boom." As I said above, Keen's analysis fills in a gap in Generational Dynamics theory, by describing exactly where the 1970s macroeconomic models go wrong in the 2000s. Keen doesn't relate his analysis to generational theory, but it's this transition from a "well-functioning economy" to a "Ponzi economy" that occurs as the survivors of the previous financial crisis (the Great Depression) all disappear, leaving behind younger generations that have no fear of unlimited debt acceleration. The "Principle of Maximum Ruin" says that these young generations have no fear of accelerating debt until the trend exhausts itself, causing them to lose everything in a new Depression. As Keen points out, this lesson has not yet been learned, and the worst of the financial crisis is yet to come.